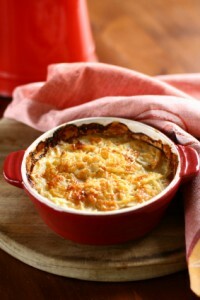 This is a classic winter side dish, hearty enough to make a meal when served with a green salad. Butter a 1-quart covered baking dish. In a large bowl, toss potatoes, salt, pepper, nutmeg and garlic together to coat evenly. 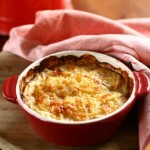 Layer potatoes and Gruyere cheese into baking dish 1/3 at a time; potatoes, cheese, potatoes, cheese, potatoes, cheese. In a small bowl, beat together eggs and cream and butter. Pour evenly over potatoes. Top with Parmesan cheese. Bake covered for 35 minutes. Remove cover and bake for an additional 10 minutes.